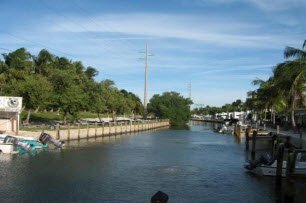 Big Pine Key Fishing Lodge has everything that either a camper who requires a bit of comfort, or someone who wants basic, basic, basic camping could ever want to find in a campsite. The lodge sits on a natural Oceanside inlet that was made when the Spanish Harbour Channel was dredged in order to allow access to Flagler's Railroad. The sites range from truly rustic grass or dirt tent sites without water or electricity through to full hooks at the dockside sites. And it really is a great place as not just campers are catered for, but those who love the water too. The boat basin, which has been part of the Lodge since the late 1950's, comfortably provides moorings for boats up to 25 feet long for a per-foot daily charge. Another one of the great things about this site is the way they really try to provide for the keen fisherman. All across the site you will find fish cleaning stations, so that you can easily and conveniently prepare the catch of the day for that evening’s dinner. And it is that relaxed and helpful way of doing things that really make this campsite a delight. Although this campsite does do things in a low key way, the one thing they do not scrimp on is cleanliness. Everything is spotless...the restrooms, rec room, pool area, etc. And what better way after a day exploring the natural beauty of the area than a dip in the heated swimming pool. And whilst you are relaxing in the warm water do not be surprised to see one of the local deer pay you a visit. 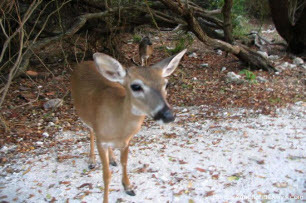 It is wonderful to see Bambi trot across the site, but if it doesn't happen then don't worry you can go down to the Key Deer Refuge just a short step from the Fishing Lodge. One Drawback to the site is that Pets are not allowed on the site. Rates are based on one or two occupants with one vehicle and one camping unit. Children younger than age six stay free.